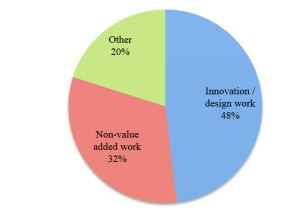 Engineers report spending a third of their time on non-value added work. Even worse, 20% of their time is spent working with outdated information, which often leads to wasted effort and rework. Companies need to keep engineers focused on developing differentiated products that stand out from the competition. But they can’t do that if they are spending time on non-value added work. Analyst firm Tech-Clarity studied the drivers of non-value added work. They share their results in this 16 page white paper, along with their recommendations on how to reduce time wasted on these activities.